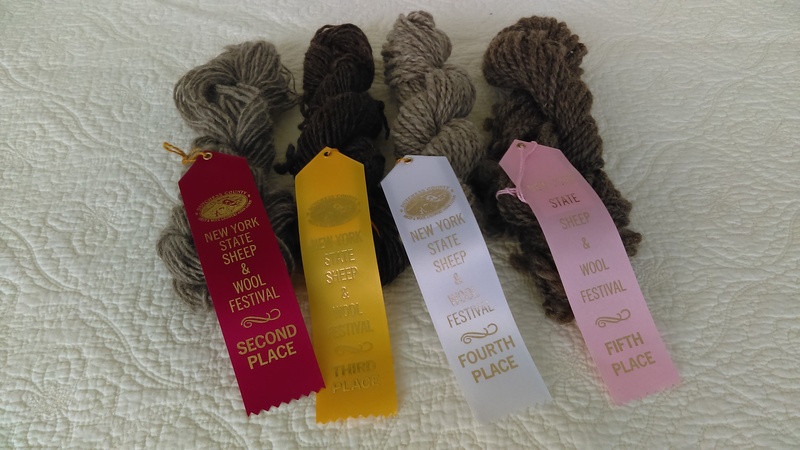 NYS Sheep & Wool Festival – Another Fabulous Year! The NYS Sheep and Wool Festival was last weekend. What a wonderful event! Blustery and very Fall-like it was a perfect day for walking the event booths and rows and rows of vendors while snuggling up in your cozy wool sweaters & hats! One of my favorites is the display booth of different breeds of sheep. There I got to see the Finnsheep and Bluefaced Leicester among many others. Pictured here are the ribbons I won for handspun yarn. Left to right are Meg, singles, Evie, singles, Jasper, 2 ply and Anna, 2 ply. As always, I am delighted and excited about my winnings this year. On to next year – October 19, 2019!